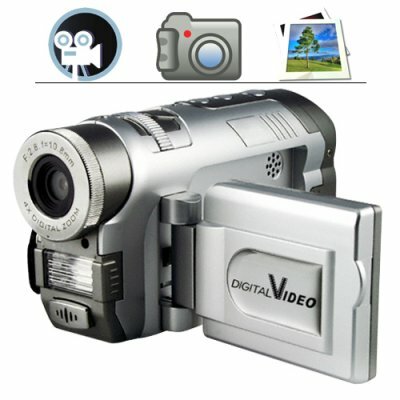 Successfully Added Wholesale Digital Camcorder with Front MIC to your Shopping Cart. Wholesale Digital Camcorder with front mounted MIC. Newly updated version of our popular DV3815 entry level horizontal body camcorder, this model makes it easy for anyone to begin taking videos and photos with good results. The frontside microphone makes it especially easy to record sound for a beginner. Having a 1.7 inch color TFT rotating view screen and simple buttons for all the important function, this entry level DV camera will have you up and making pictures and home movies in no time. Better still, since this model uses reliable and readily available AA batteries, there is no need to ever buy expensive batteries in the future. If you need more power when you are out and about, just put in some new AA batteries! The CVA-DV3815 records videos in computer friendly 640x480 resolution and still image photos in a variety of high quality JPG file sizes. If you or someone you know wants to get a digital camcorder to start making home videos but only needs a simple one to get started with, then this is the right model to choose. A low priced way to make your own pro style movies and videos at a family friendly budget price, the CVA-DV3815 is in stock in our warehouse right now and is available for single piece or large bulk orders. A great quality entry level camera at a factory- direct wholesale price, order your new camera now and start recording all those special moments for everyone to enjoy. In our warehouse right now, will ship out same day you order it! Package includes DV camera, carrying bag, cables, and detailed instruction manual - you just provide the power and the enthusiasm! we are importer of camcorder, mobile phone, computer to iran please send me this product as sample for marketing in iran.